LEED v4 will take a more holistic approach to defining a green building material with a particular focus on lifecycle impacts in addition to supply chain management, taking the program’s scope one step deeper into the manufacturing process. This change is expected to influence the information designers and architects are requesting from manufacturers. Architects are requiring more rigorous information from manufacturers, by requesting them to collect information outside their localized manufacturing process. In the past—self-declared recycled content and bare-bones regional declarations were enough to meet credit requirements. Now, green building programs like LEED and the International Living Future’s Living Building Challenge are redefining what makes a material sustainable. Less emphasis is being put on the product’s individual attributes. This is a sweet spot for the stone industry and our materials. Constructing buildings in an environmentally-considerate way requires careful thought and planning. However, the payback from a green building far outweighs this price. Conventional building practices consume large quantities of energy and water, while generating excessive air emissions and waste streams; these impacts are also caused by product manufacturing. Moreover, indoor air quality can be impaired when unhealthy building materials are employed. Implementing green building techniques reduces impacts on the environment and human health during both construction and operation of a structure, as well as during production of building materials. If this harm is not reason enough to build responsibly, consider the financial aspect. Resource consumption and medical care can become expensive for the builder, the material manufacturer, and the employer of those working in the structure. 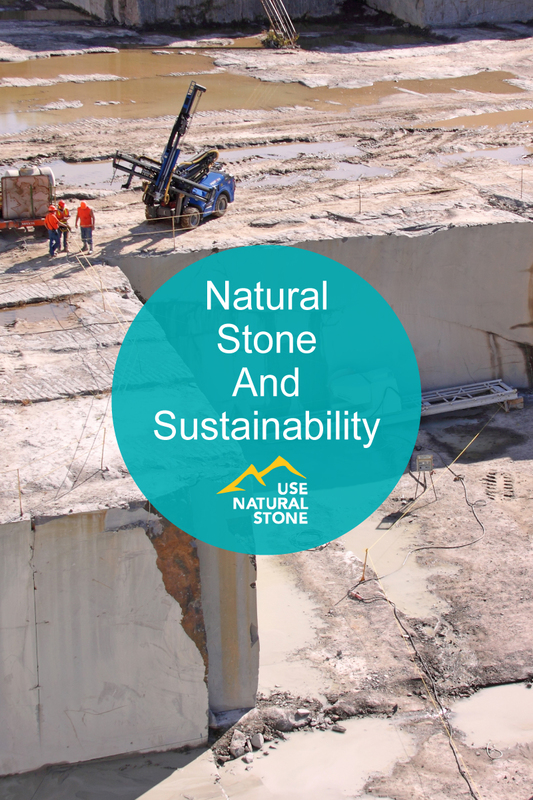 After many years, and a great investment of time and resources, the natural stone industry is able to tell the world about its sustainability standard. This standard will assure architects, landscape architects, designers, contractors, owners and others that there is verifiable data to compare natural stone with other competitive products in this rapidly changing green building environment. 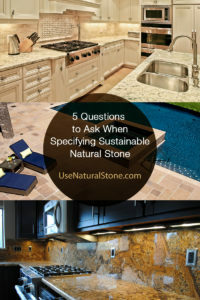 The purpose of the Sustainability Assessment for Natural Dimension Stone is to recognize sustainability practices in the natural stone industry – practices many members already follow but don’t document or promote. This voluntary standard will eventually give quarries and primary processing plants the ability to certify their operations (and subsequently their stones) as sustainable. Third party verification of conformance to a set of well-defined environmental, ecological, social responsibility and human health metrics will be required. To date, the stone industry has not been able to compete on a level playing field with other industries that already have a standard like this in place such as wood, tile and carpet. Establish a set of well-defined environmental and human health metrics recognized by the green building movement as an indicator of leadership sustainability performance. 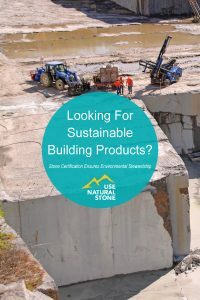 Provide an important opportunity to educate key members of the green building movement, government, and environmental advocacy groups about the production of stone products. Create a mechanism that rewards natural stone companies that demonstrate environmental leadership through commitment to sustainable operations and continued innovation. Proactively address potential stone-related environmental and human health concerns in a multi-stakeholder, science based forum (i.e. radon, dust, etc.). Harmonize national and international environmental requirements for stone quarrying and production. Encourage transparent chain of custody reporting in support of LEED credits. Create parity between stone and other competitive products covered by existing certification programs. This Standard defines Environmentally Preferable Manufacturing Practices (EPMP’s) for the quarrying and manufacture of dimensional stone products, and establishes baseline requirements for EPMP’s applicable to all stone manufacturers and processors. Specifically, the standard defines criteria that consider the social, environmental, and human health impacts associated with the dimensional, natural stone product life-cycle including but not limited to the quarrying and manufacturing life-cycle stages. 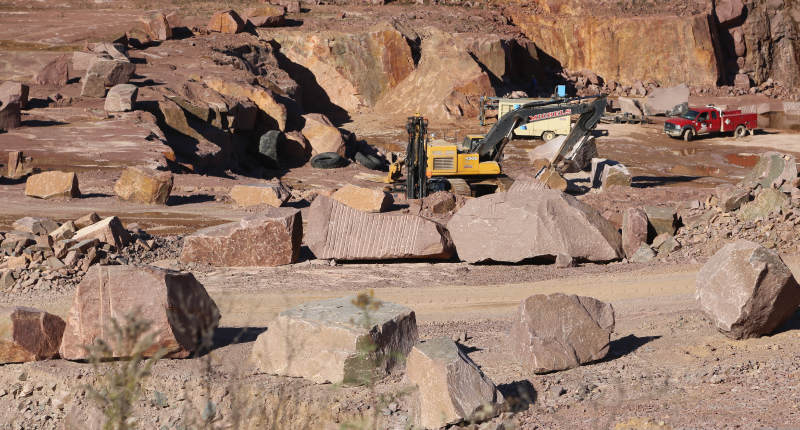 Because stone is quarried in countries around the world, the scope of the standard includes both North American and International quarries and processing facilities, and considers logistics and transportation issues during criteria development. The standard will assist in the determination of whether a dimensional stone product has been produced and transported in an environmentally preferable manner consistent with the principles of sustainability. The standard focuses on North American based stone products and operations, but is developed with the participation and cooperation of the international stone community and is the basis for expanding to a proposed international-based ISO certification. Criteria define both environmentally preferable products and stone production operations. We can especially do our part to contribute to responsible building by providing materials that have been quarried and processed in an environmentally-conscious manner. Further, we are exploring the implications of natural stone application during the use phase and beyond, particularly with regard to durability, solar reflectance, and salvage and reuse. 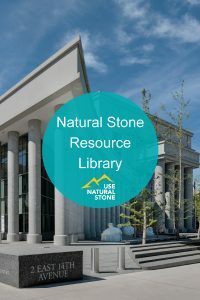 This work addresses the entire life-cycle of natural stone, substantiating on a holistic level the position of natural stone as a green building material. Solid waste management is a fundamental component to any manufacturing or production enterprise. The natural stone industry is unique in that the majority of its solid waste stream is its raw material. It is estimated that 175 million tons of quarrying waste are produced each year,1 and although a portion of this waste may be utilized on-site, such as for excavation pit refill or berm construction, it is often difficult to find a use for all scrap stone and fines produced. Coupling this with the industry’s other waste streams, such as heavy equipment, wastewater sludge, and general site trash, it is necessary that every operation in the natural stone industry develop and abide by a waste management plan.